I'm away from my computer today -- I'll visit your photo as soon as I can. I'm not doing Wordless. But saw you on Twitter. This really cool. Appears lit from inside! You can never go wrong with roses. Well then I need to get me a super macro. Your flower photos are amazing. Love the top-lighting, it shows the translucence of the rose petals. It's beautiful and somewhat surreal, as if you stumbled upon a secret garden in a dream. I love the shading and variety of colors this shows. Lovely macro. The night shot gives it a beautiful vignette. This is an absolutely gorgeous shot! 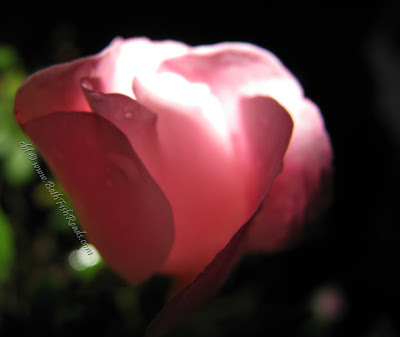 Beautiful capture of the rose at night. I love the lighting and soft edges. Gorgeous and thanks for explaining how you shot it.